Hello everyone! If you read my blog on the regular, you probably should know how I like winter. 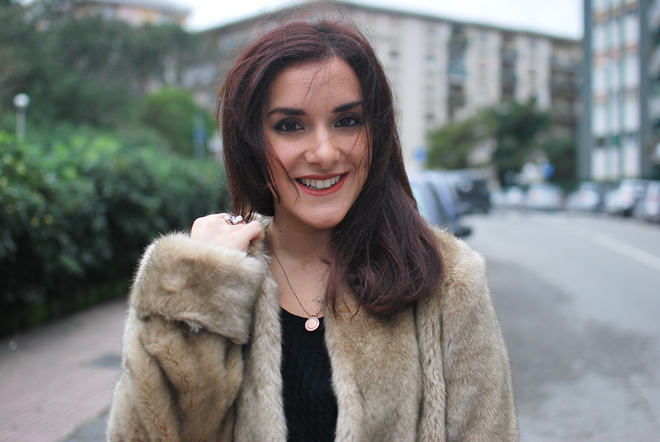 For the look of the day I decided to go for my new faux fur jacket, got from Zara on sale. Its brown shade it’s perfect matching it to black and other neutral colors, so I think I’ll be wearing it a lot during this season. Since I tend to mix and match different styles, in this outfit I chose the contrast between the elegant fur and the ripped black jeans. A pair of skinny black jeans is the best option in so many combos, from pumps and boots to sneakers. To complete the look, a shoulder bag and studded booties to make the whole more edgy.